A flexible and complete sound design environment that not only rivals Kontakt 5 as a sampler, but also is a splendid synth. Sounds amazing; performance possibilities through scripting are endless; synth engines broaden sonic range; an excellent sampler; massive, easily accessible library; detailed mixer with plenty of effects. Drum kit a bit limited. With MOTU's MachFive 3 you can have an unlimited number of keygroups (centre) for layering, velocity switching and key following. MachFive 3's mixer environment is stuffed with functionality, including an extraordinary array of effects. MachFive 3 includes seven outstanding scripted instruments for realistic performances full of nuances. It's been over four years since we reviewed version 2 of MOTU's MachFive sampler. What we saw back then was a great sampler standing in the shadows of Native Instruments' near-unimpeachable Kontakt. We felt that MachFive 2 was, in fact, let down by the computer hardware running it: it desperately wanted to do more than the processing capabilities of the day allowed. "The scale of the thing is truly spectacular: the library, the sampling, the synthesis, the scripting, the mixing…"
Fast-forward four years and those obstacles are no more as processing is lightning fast and RAM much cheaper. And as well as benefiting from these advancements, MachFive 3 takes an evolutionary step from mere sampler to something much more complex. 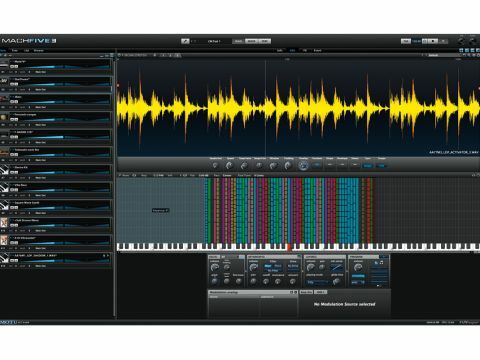 Let's get the bit that you can't see out of the way first: the audio engine responsible for the sound and streamlined processing has been upgraded to UltimateSoundBank's UVI Engine XT. The old version felt sticky; MachFive 3 is smooth and fast, and sounds absolutely pristine. Another benefit of the new engine is its seamless handling of different sample rates, which might help with library organisation - keep everything at 32-bit/192kHz and MachFive will downsample when it has to. Staggeringly, all of this runs happily in up to 7.1 true surround. OK, you'll be taxing your system heavily at that level, but it's there if you can handle it. The new window layout looks much more slick and attractive than before, and with the standalone version, you can expand to full-screen for luxurious precision editing. In response to Kontakt's hugely successful KSP (Kontakt Scripting Processor), the big buzzword for this revision is 'scripting', which adds a new level of expression and articulation to performance instrument patches. What makes MachFive 3 more than just a sampler? Its 12 synth engines, that's what. These can either be used independently or combined with the sampling engine to create hybrid sounds. Analogue Stacks, FM, Wavetable, Granular and Drum are just some of the oscillators on offer. You can also assign different synth modules to different key ranges within the same part; so, for example, you could create a whole synth drum kit across a key-span using different Drum oscillators. The Analogue Stacks can produce very rich tones, and with all the subsequent envelopes and modulators that can be brought into play, MachFive 3 qualifies as a full-on synth. Back to sampling! The new Loop Lab enables slicing and rearranging of audio loops, as well assimilar editing of REX, ACID, Apple Loops andUFS files. MOTU has also teamed up with French audio boffins IRCAM to build high-quality granular processing into MachFive, for superb-sounding timestretching and pitchshifting. Each of the infinite keygroups has its own volume, pan, drive, filtering and envelopes, and virtually all parameters can be automated and modulated via a limitless number of envelopes (AHD, DAHDSR and the freely drawable Multi), LFOs and step-sequencers, as well as the usual MIDI controller options. You'll never feel limited by MachFive 3 - the more you work with it, the more awesome the sheer scale of it becomes. The mixer environment looks like the mixer page of a full-on DAW. Each part has its own channel, into which you can insert any of 47 built-in effects, and there are auxiliary sends and return channels for shared reverbs, delays, etc. The list of effects is endless, going well beyond the usual EQs, dynamics and delays. Filter freaks will go nuts for the new Xpander filter, which is based on the Oberheim filter of the same name and packs 37 modes. On the reverb front, there's a convolution reverb (IR Verb) onboard, which uses impulse responses from various natural spaces and classic hardware units. It sounds fantastic - as good as any other convolution 'verb we've heard. There's also an algorithmic reverb called SparkVerb that features a feedback delay network, separate High and Bass decay settings (with adjustable crossovers) and detune in cents. MachFive 3 isn't short on bundled sounds, either. It comes with a whopping 45GB library ofsamples and multisampled instruments on seven DVDs. For some idea of the performance detail you can expect, consider the fact that there's one full DVD for the Electric Piano alone and another for the Telecaster! Thankfully, finding and auditioning sounds from within thehuge library is made very easy by the multicolumn browser. MachFive 3 goes to great lengths to realistically reproduce the sound of acoustic and electric instruments, and this is helped by its new scripting system. Scripting enables - among other things - incoming MIDI data to be transformed before it reaches its target parts. Possibilities include everything from arpeggiators and portamento to chord recognition and vibrato. Take the Telematic scripted instrument, which is a multisampled Fender Telecaster guitar. It comprises over 2400 samples, and the scripting enables incoming chord information to be transformed into the natural voicing of a guitar. Keyboard switching enables up and down strums and single notes for arpeggiation, while with round robin playback, each hit sounds slightly different. Plus there are hammer-ons, slides, mutes and fret noise, as well as controls that enable change of strumming speed for stabs, glissandi and everything in between. The other included instruments are a Fender Jazz bass, an upright bass, a full drum kit, a grand piano, an electric piano and a percussion section. The drum kit is the least impressive, but the others are spectacular. We really hope that third-party developers get behind MachFiveScript with the same enthusiasm as they have with NI's KSP. MachFive 3 is advertised as the only software instrument you'll ever need, and there really is no reason why it couldn't be - apart from the general benefits of diversity, of course. The scale of the thing is truly spectacular: the library, the sampling, the synthesis, the scripting, the mixing and processing … and despite all that power, it's surprisingly easy to use if you're at all familiar with general software sampler architecture. The scripting might take a while to get your head around, and you could question the necessity of using so much technology to replicate a guitar player when there are so many of the real thing out there, but the range of sonic possibilities opened up by this one instrument is truly wondrous to behold. To conclude, then, MachFive 3 is on a par with Kontakt 5 - it's even a step ahead of it in several areas.